Many people are looking for reliable and safe transport from Johannesburg to the Kruger Park, and there are a number of options which one can choose from, including flights, shuttle services, and taxi services. These options have their own different pros and cons, which are dependent on one’s budget when it comes to transportation from Johannesburg to Kruger National Park. The Kruger National Park is one of Africa’s great tourist attractions and it is located around 425 km from Johannesburg. When planning a trip from Johannesburg, it is possible to fly to one of three airports operating within the Kruger Park region. There isn’t one particular airport which one can say is the closest airport to Kruger National Park, as there are three different airports which are located in the Northern, Southern, and Central Kruger Park. There are daily flights which will assist with transport to Kruger National Park from Johannesburg. These airports which operate are Skukuza Airport, Phalaborwa Airport, Hoedspruit Airport and the Kruger/Mpumalanga International Airport (KMIA), located between Nelspruit and White River. Daily flights also operate to Skukuza from Cape Town. If you are looking for transfer from Johannesburg to the Kruger Park, there are also numerous shuttle services available which can pick you up from your home or most convenient location. Private bus shuttles also operate between Kruger Mpumalanga International Airport (KMIA) to Kruger National Park. If you are in need of transportation from Johannesburg airport to Kruger Park, shuttle services are readily available for easy and reliable transport. These shuttles are cost effective and great for transporting groups of people such as families or tour groups. One can also catch a taxi from Johannesburg to Kruger National Park, but they tend to be far more expensive compared to shuttle services which are more accommodating. 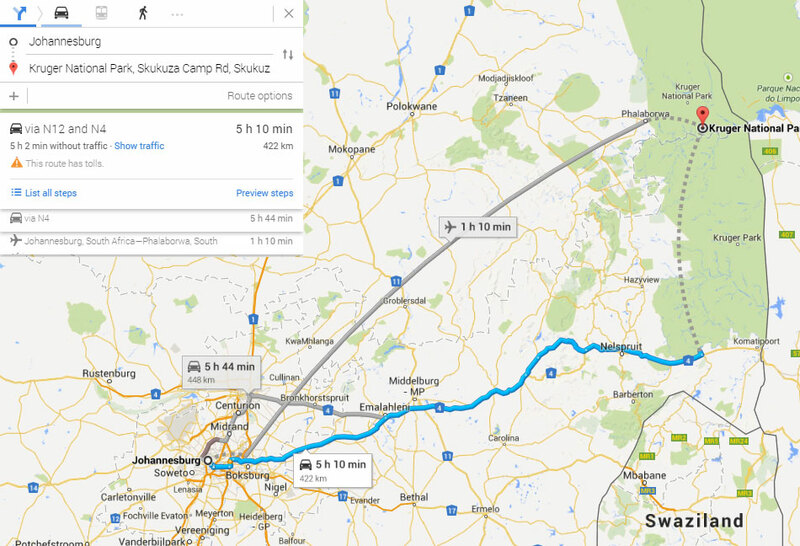 All roads leading to the Kruger Park are tarred and in excellent condition, and the route is easy to follow on a map. If you decide to drive yourself, be sure to get a good night’s rest so that you are alert on the road. It is a good idea to make regular stops to stretch your legs and replenish yourself. The Kruger National Park is very efficient when it comes to organizing transport to their beautiful park, whether it is from the airport to Kruger National Park, or from a pick-up point of your choice. There are chartered flights to KMIA, as well as airport transfers to the Park which can be arranged by mini bus. Bookings can be done online or by calling the relevant person/company to assist.